Las Vegas Academy is a historical high school located approximately two blocks from the Las Vegas strip and less than ten blocks from the historical downtown area. The building was built in 1930 and is the institution of education for many of Las Vegas’ famed casino and hotel entrepreneurs. The architectural detail of the building, what has become known as the band or the “golden border” around the entire building, particularly the front door entrance, was covered up from many years of painting. After over 70 years of exterior paint jobs, the entire band had been covered up to the extent that you couldn’t see any of the original architectural detail that was significant to the building. 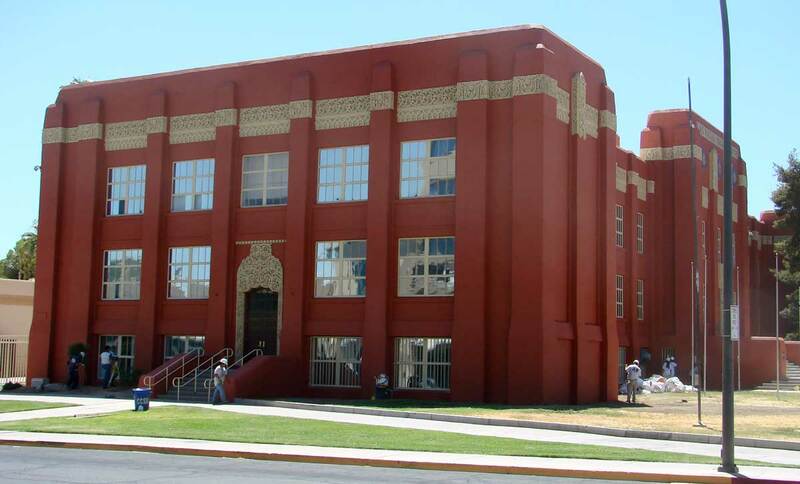 There were several people involved from National as well as Nevada State Historical Society that governed and monitored all processes and specified the original color and scope of work on this project. One of the greatest challenges was the failing exterior paint that was peeling due to the extreme element conditions that exist in the southern Nevada summer. It was also discovered that all of the putty used to glaze the original window panes contained ACM (Asbestos Containing Material) which needed to be abated. In addition, since this historical building was built in 1930, it was apparent that it also contained years of lead based paint on all surfaces that would also need to be abated. Another large challenge was the weather – the project was taking place during the hot summer month of August and had to be completed in less than 21 days and within budget. The project also required a safe work place environment, including dust control, for all working staff of A & B Environmental. In order to meet and exceed the scope of work for this project, all of the exterior elements needed to be considered. 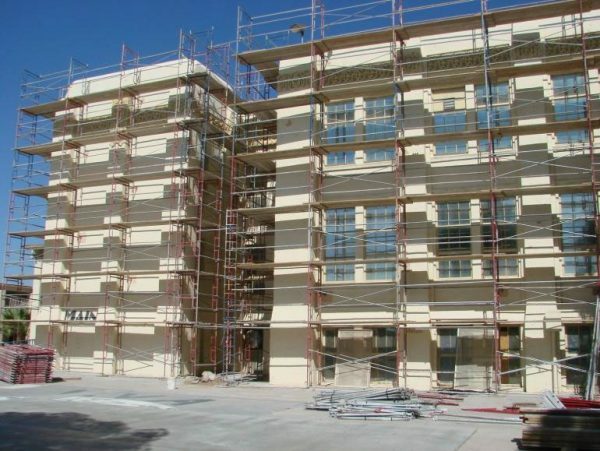 This included scaffolding and an eight mil fire retardant wrap around the entire work area of the five story building. 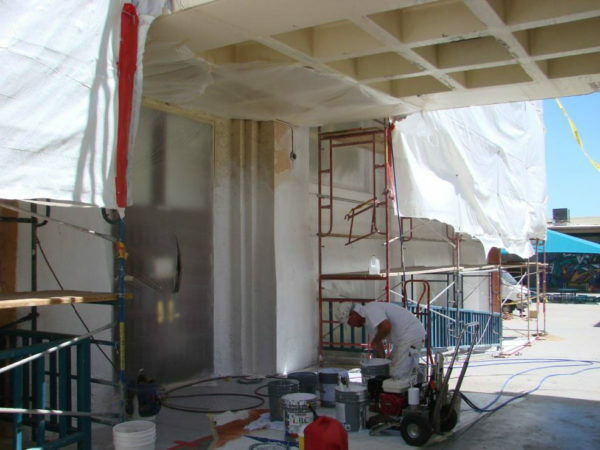 These elements were required in order to keep the general public and returning student population safe away from any of the ACM and lead based paint contaminant present at the worksite. Many large negative air scrubbing machines were staged across the worksite to clean and remove contaminated air. Since this project was being monitored by the city of Las Vegas, Clark County project managers and environmental inspectors from the historical district of Nevada, the working staff at A & B Environmental took great precautionary measures for safety and compliance. During the entire month of August 2008 when this project took place, temperatures during the day were always well above 100 degrees with 80 degree nights. Luckily, no rain occurred during the entire duration of the project. The job was conducted during the summer months as not to disrupt the school year and to minimize the student population around campus as well as the safety of the urban population in close proximity to the heavily populated downtown areas of Las Vegas. As stated above, the Las Vegas Academy building was found to contain lead based paint and ACM, both of which had to be abated under containment. ACM was found in all 2,160 window panes – all of which had to be hand masked off to prep for the multiple layers of tinted encapsulatant needed to meet the specifications and conditions agreed upon for the project. An exterior fence was placed around the entire building to enclose the scaffolding. 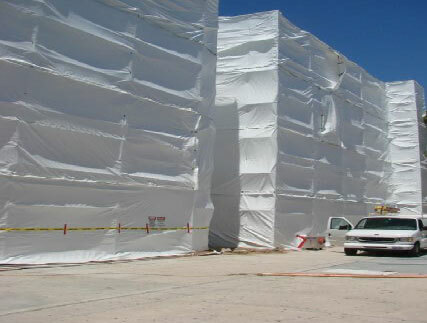 Then, an eight mil plastic fire retardant wrap was applied around the entire building to prevent any hazardous materials from being released into the air. The building was also under negative air pressure for the entire duration of the project until it was unwrapped and the scaffolding was removed. Organizations such as the city of Las Vegas, Clark County officials, State of Nevada Historical officials and OSHA were all monitoring this project for the 19 days it took to complete it. The entire project took 19 days to complete, which was two days earlier than quoted, and, as a result, did not disrupt the local community or upcoming school year. A & B Environmental was able to stay within the budgeted labor and material costs, overall using 160 five gallon pails of L-B-C.
All ACM in the putty of the exterior windows was disposed of properly. There was additional scope of work to the project where the bottom row of all the windows around the entire building were removed. Security bars were placed on the first story windows as a security measure since this historical building is located in a very urban downtown area of Las Vegas. Clark County School District was completely satisfied with the end results. “The job looks spectacular,” said John Regan, a Clark County official. The extensive monitoring by all government, city, and state officials, as well as steps that were taken by A & B Environmental, all made the project run as smooth as possible. 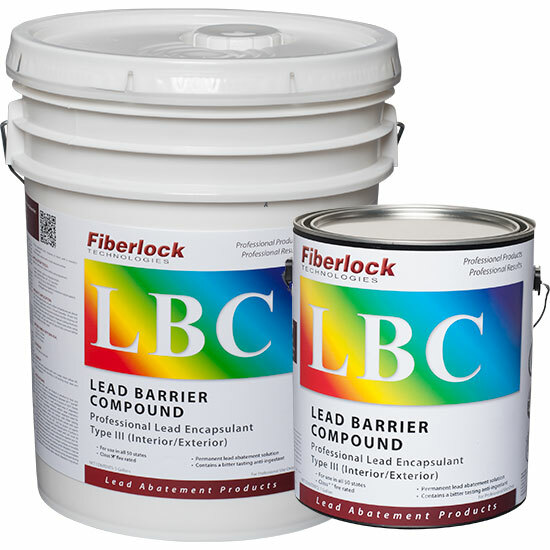 One of the steps that A & B Environmental offered and incorporated in their bid was tinting all three coats of LBC that were applied with the exception of the architectural band. Tinting per coat with slightly different amounts of darker colors allowed them to achieve the original color of the building and therefore satisfy those observing the multiple steps of application. This project had a late start. The first 3 days of the total 19 were done in double shifts with over time. The balance was completed with 16 days from start to finish, but still 2 days earlier than originally estimated. The plaque that sits on a bench in front of the historical Las Vegas Academy reads “The Jewel of the Desert”. It was donated by Phyllis Bradley Binion, a graduate of the Academy in 1952 and the heiress of the famed Binion hotels and casinos. The entrance and floor frontage of the school has what is called Senior Squares, which represent years of graduates dating back to the 1930’s, but was stopped during The Great Depression and during WWII in the 1940’s. The tradition of the Senior Squares was created one night in 1941 when two students pulled a prank and painted one of the corner cement slabs in front of the main steps of the original Las Vegas high school. The principal at the time, Maude Frazer, actually liked the idea and decided to dedicate it to the the Art Guild and recommended that they carry on the project in subsequent years. The ensuing senior classes created their own squares over the years and the underclassmen who dared walk on them had to clean the squares with a toothbrush. In 1980, the squares were removed, which caused a huge uproar with the Las Vegas Academy alumni. After a protest square was painted, the squares were re-created in “Pebble Tech”, which was also used for the new squares until 1988. By 2000, the squares were deteriorated and many were barely recognizable. In 2000, spearheaded by the class of 1970, the Senior Squares Committee and all of the Las Vegas Academy high school alumni, they decided to re-create the squares as close as possible to their original colors and design. Because there were originally no squares created for the classes in the years during WWII (1942 through 1945), special squares were designed to honor the graduates of these years. The restoration project and ongoing maintenance is funded by a grant from the state of Nevada and by the individual donations of funds for their time, labor, and materials. The Senior Squares are an important part of Las Vegas history and it is hoped they will be maintained for many years to come.